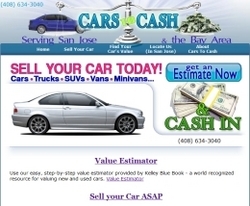 New Bay Area Website Will Buy Your Car Today! - A downtown based website is purchasing cars from all around the Bay Area, paying competitive prices. Looking to spur the economy carstocash.net is paying for all kinds of used vehicles: cars, trucks, vans, minivans, etc. An official Kelley Blue Book value estimator is built into carstocash.net so its users can be sure they are getting a fair market value for their used vehicle. Users can upload pictures of their car for sale, and get a quick call back with a quote. Traditionally people looking to sell their car would ask KBB prices through classifieds – online, or in the paper. Cars to Cash wants to make selling used cars a one-day process. Cars to Cash is safer than classifieds, as you don’t have to entertain strangers and give out your home address to make a sale. About Cars to Cash:“Cars to Cash proudly serves the San Francisco – San Jose Bay Area, with a convenient, pain-free option to get the most out of your pre-owned vehicle. Our business is really a service to you and our community – so we will take every step necessary to make sure our clients, neighbors and friends enjoy working with us.